One of my favorite things to do as long as I can remember is making cookies. Even at 3 years old I have vivid memories of the cube of butter mixing with the sugar to make a wonderful dessert that would melt in my mouth. Being the family baker was fun but this love was not going to lead me to the life of health, which I so desired. Becoming a dietitian was my way of incorporating my love for food paired with a way to create recipes designed for health and vitality. For Valentines Day this year I decided to take a cookie recipe I created last year and enhance it to utilize coconut oil to improve the fat profile and make the cookie gluten-free – not an easy feat. When substituting coconut oil for butter you use three-quarters of the amount. Since the recipe called for 1 cup of butter I substituted three-quarters of a cup of Kelapo extra-virgin coconut oil. 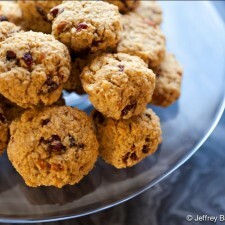 The original recipe I created used wheat flour and I wanted to use a combination of coconut and almond flours. Since these flours are denser, the volume of flour needed to be cut significantly while increasing the liquid. I doubled the eggs and lowered the measurements of the flour, hoping for the best. 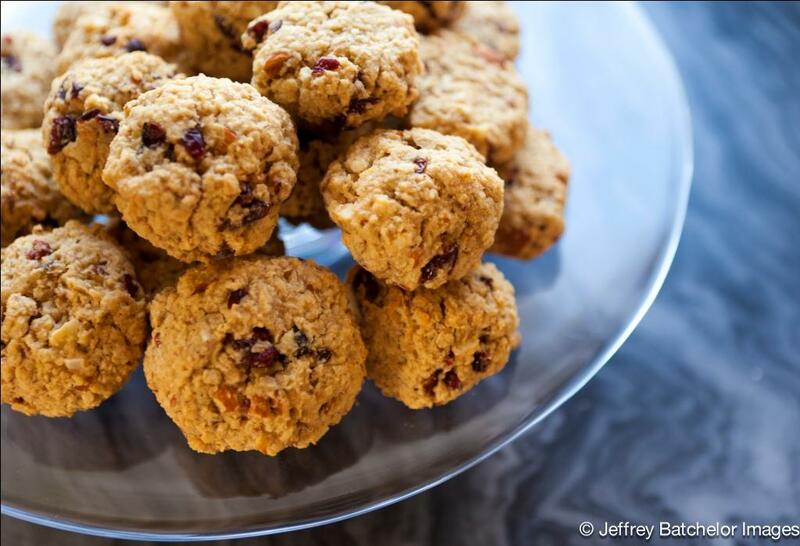 A healthy dense gluten-free cookie that is full of nutrients, lower in carbohydrate/sugar, and higher in protein and fiber. Even my cookie critic Jeffrey gave me the thumbs up. Now that’s a happy Valentine! Easy to make with little to no mess since only simple stirring required, and will keep in the freezer for a few weeks if you desire to make them ahead of schedule. Bon Appetit! Mix together flours, baking powder, salt and nutmeg and set aside. Melt coconut oil till liquid consistency and cream together with sugars. Add eggs one at a time and mix. Add oats, nuts and cranberries, and mix well. Scoop cookie dough on lined baking sheet and bake until slightly brown (about 15-20 minutes). Take out and let sit 1-2 minutes and then put on rack to cool. Makes 36 nice sized cookies. Enjoy! – Susan B. Dopart, M.S., R.D., C.D.E. Have you ever considered using coconut sugar in place of white sugar? It transfers 1 to 1 and is delicious! I have not done a ton of baking with coconut sugar, but I will definitely have to give it a try. Thanks for the tip! Do you use fresh cranberries or dried? I used dried – adds a little sweetness whereas the fresh might make it too tart (but if someone wanted less sweet could work).